That calorie count isn't too restrictive, but the tricky part is sticking to it when I'm not at home! This past week I was visiting my parents on vacation, and I don't think I could have had a tougher diet challenge. It's guaranteed that my parents' kitchen contains Pepperidge Farm cookies, Häagen-Dazs ice cream bars, peanut-butter cups, chocolate bars... and on top of all that, requests for me to bake or cook their favorite foods. (I made a bittersweet chocolate tart for my mother on this trip.) And then, there's the many restaurant meals to eat with family and old friends. Pack my own treat. It's no secret I love chocolate. I took a few bars of my favorites so I could have a small yet decadent snack in the evening. The trick is finding a treat that's not only lower in calories than the other temptations around me but also something I look forward to. 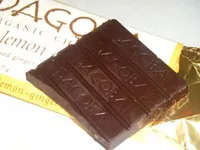 (Otherwise, hello, Häagen-Dazs bars...) This entire Lemon Ginger Dagoba bar has 250 calories; I can savor it over three nights, as long as my boyfriend doesn't find it. Total: About 84 calories. Eat a big breakfast. There are a number of studies about the benefits of eating a large breakfast while dieting, and a big morning meal is my MO. It keeps me full for hours, so I don't snack. 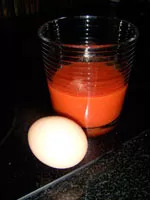 Research shows eggs for breakfast can also help cut the calories you consume for the rest of the day, and the majority of successful dieters in the National Weight Control Registry say they eat breakfast every day as part of their strategy to keep the pounds off. A big breakfast doesn't have to mean a thousand calories of flapjacks soaked with butter and syrup, and greasy sausage or bacon. But a 600-calorie breakfast made of healthy carbs and proteins can help you lose more weight in the long run, according to a Virginia Commonwealth University study. If you want to try this strategy, check out the Lose 10 and Never Feel Hungry diet plan—we built it to take advantage of the benefits of eating most of your calories by noon. It works very well with our Feel Great Weight program too. My usual breakfast is a bean burrito and a banana or some other fruit—about 420 calories. 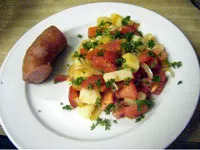 Since I had time to cook in the morning while on vacation, I filled up on a hash of potatoes, tomatoes, red bell peppers, red onions, and parsley, plus a little smoked sausage and a glass of OJ on the side. Total: 468 calories. Take over the kitchen. Cooking skills pay off in giving me the ultimate control over what I eat! 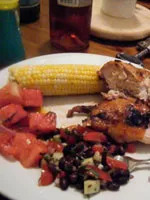 This night we grilled corn and chicken (flavored with my mom's very tangy and not-too-sweet homemade barbecue sauce). I made a tomato-watermelon salad with feta and mint (here's a similar recipe from our sister magazine, Southern Living), and a cucumber–black bean salad (similar to this Cooking Light recipe, but I used quartered grape tomatoes instead of mango, and omitted the orange juice; my salad also has cilantro). 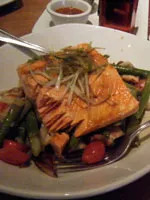 Total, including a glass of Riesling: 784 calories. Have a plan B for slips. 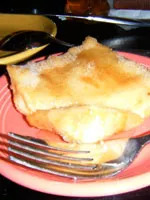 I'm not a perfect dieter: I couldn't pass up this hot sopaipilla with generous drizzles of honey. The restaurant had no nutrition numbers, and sopaipillas are not on the USDA's National Nutrient Database or other Internet-based calorie-counting tools I use. (I can't wait until these lists catch up with the diverse ethnic food culture we have in this country now.) Comparing caloric amounts I could find online, I'm guessing the whole thing had about 300 calories. My compromise: I ate only half the sopaipilla, and cut out some calories the next day. I'll guess I had a tablespoon of honey. Total, 214 calories.